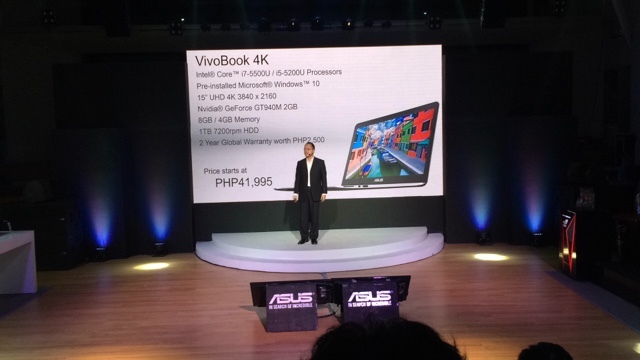 This quarter looks so promising for ASUS as they got new, more powerful, aesthetically superior and efficient gaming laptops, notebooks and computers launched at Valkyrie in BGC. Aside from honoring their top of the line hardware, they invited their best authorized sellers and gave them recognition plus had them witness the unveiling of these really cool machines last night. ASUS remains the number 1 brand in Southeast Asia, number 3 in terms of Notebook sales in the Philippines. Mr. Calum Chisolm the GM of Intel Philippines says they also will be including the best intel chips on the new line of notebooks that ASUS is releasing in the market. I specifically like the ASUS ROG rigs that they have which is perfect for gamers like the model ASUS ROG G752 that's got superior graphics, with an Armor Titanium and Plasma Copper finish that would make Iron Man envy the thing when you hold it. Bandwidth management on it would make your gaming experience even better (in the hopes of no lags and give your line more resources), unless it's the problem on your connection that is. It also comes with a gaming headset and it's own bag. You might also get interested with the ROG G501 which has almost the same performance as the latter, with almost the same specs though. Almost a Php 20K difference though as the G752 is around Php 79,995 just like the G501. If you're in the hunt for gaming gear, these guys know what they are talking about. Another thing to note is the ASUS ZEN AiO. It's like an iMac, but it's not and is designed to be a connected hub for all your ASUS devices. You can backup over the network without the need of cords as it's all wireless. It's also got a 4K UHD display, so photos were really stunning during the preview earlier. Let's just say I was drooling during this time and if I had something on my wishlist this Christmas, that would be it. It's pretty steep at Php 109,995. They've got more up their sleeves so make sure you follow them on Facebook and Instagram which are both updated.